Winter in Canberra can be such a mind melter. When you look out the window the skies are blue and the sun is shining. Then you step outside and realise it is all of -3 degrees and the wind is howling and you may just die of exposure on the way from your front door to your car. Brr! Now while Past Amanda would be all scowly and cursing the winter gods, Present Amanda has gotten smart and invested in thermals and a snug coat. Huzzah! And the most important part of this snug new look? A super sassy beanie! 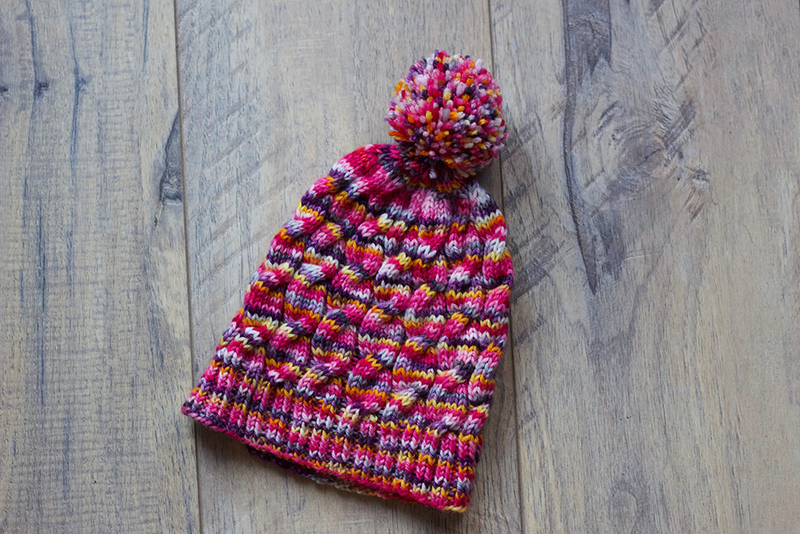 This cheerful number is the Olive & Jack hat pattern by Sarah Stevens. It is a multi-size beanie featuring a simple offset cable pattern that knits up super quick. This was my first go at cables and I found this ridiculously satisfying and also a great way to learn the difference between cables forward and back. I truly had no idea how easy they would be! The yarn I used for this is something special. It is a hand dyed DK weight from Clementine & Thread. The yarn itself is a superfine merino that was lovely to the touch and I just couldn’t say no to a colour called Autumnal Steampunk. The skein was 211m but I ended up having a bit left over even after making the mega pompom. Knitting wise this was a super quick and enjoyable pattern. The instructions were really clear and the only hiccups I had was from my own stupidity misreading the sizing. After casting on and getting the brim knit, I tried the beanie on (aka sassy 80s tennis headband look) and it slipped down over my face. After freaking out about needle size I realised I had read the measurements wrong. Oops! Once I got the size right it was a super quick knit taking me a couple of weeks of sporadic knitting. After working with only sock yarn for about a year it was insane how quickly this came together! I am seriously in love with this hat and it has become my go to winter beanie! The colours are crazy cheerful and even better it keeps my ears super snug. Plus, who can say no to a joyous multicoloured pompom? Not this lady! It was such a fun knit and totally keeps my head toasty warm! I have been using it on my runs round the lake and it has been ace! Though I am guessing mornings in the desert must be freezing where you are now? !